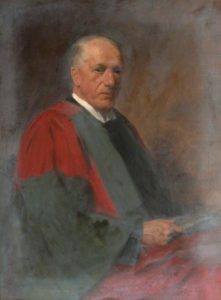 Watt, George Fiddes; Sir Robert Muir (1864-1959), Professor of Pathology at the University of Glasgow; Hunterian Art Gallery, University of Glasgow. Sir Robert Muir (1864-1959) was Professor of Pathology at Glasgow University from 1899 to 1936 and Dean of Faculties from 1946 to 1949. Born in Balfron, he was the son of a minister. He was recognized as one of the world’s leading teachers, researchers and writers in his field and was an authority on diseases of the blood cells and breast cancer. Promoted to the rank of Lieutenant-Colonel, Muir took charge of the pathological and bacteriological work at the 3rd and 4th Scottish General Hospitals during the First World War and was Inspector of Laboratories in Scotland.